Google Analytics can be an extremely powerful tool. It gives you insights into how visitors are finding and using your website but it is often misunderstood and underutilised, so let’s take a look at the system and what you can expect to find out from it. Google Analytics tracks and reports on traffic to your website, and user behaviour on your website. It is widely used and when properly interpreted, it can help you make decisions regarding website content, marketing campaigns and more! From an SEO perspective, the first thing you should look at is how visitors are finding your site. 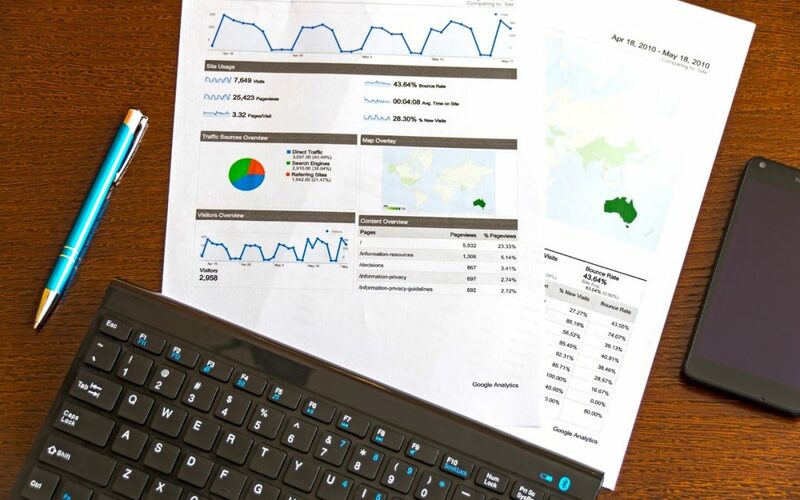 Analytics gives you a split between organic traffic which is through normal Google searchers, direct results when a visitor types your url into the address bar, and other channels such as paid and social traffic. You can see how many visitors have landed on your site in a specific time period, how many were new visitors and how many had visited your site before. If your traffic is mostly direct and paid, that’s a sign that you should do some work on your SEO to improve your organic positions. You can also use the traffic data to compare months and years, to show if traffic is increasing or decreasing over time. By monitoring traffic you can see dips and peaks, which may repeat year on year if your business, has a seasonal angle. For example a coat company would expect a dip in traffic during the summer, then a spike in October. On the other hand, a Christmas tree company wouldn’t expect much traffic until the last quarter of the year. Analytics will also tell you what sort of device visitors are using to view your site. If you find you have a lot of mobile visitors, it would be a good idea to ensure your site is responsive and loads quickly on a mobile device, or visitors can get frustrated and navigate away. That brings us to an incredibly important insight, which is the bounce rate. This is where a visitor arrives on your site but does not interact with any other page before leaving. All sites are different so you must apply real-world logic when trying to interpret the bounce rate. Is it simply that a visitor finds all the information that they need on the first page they visit and don’t need to navigate to any other page? Or would you expect a user to click onto other pages if they were engaged, and a high bounce rate suggests that there’s something in the design and content of your site that you need to reconsider. Analytics has a wealth of further information, allowing you to segment each data set to dive deeper and deeper into each category and find out how specific groups of your visitors behave. The more you use the tool, the more confident you will become in interpreting the results and making changes to your website. Set up is very straight forward and only takes a few minutes, so take a look today, you might be surprised what you find! Want to get help with your Google Analytics? Contact us today on 0333 332 6396 to talk about our one off services.